It had to be on his terms. It had to be because he had a goal. It had to be because he wanted it more than I did. That in a nutshell, is how my dad has come back to running. Back in January of 2009, my dad had said he wanted to get back into running and could I come up with a plan? Sure, I could! Got a goal? He said well maybe a ½ marathon and maybe a marathon? What time do I need to run in a marathon to qualify for Boston? My mind immediately drifted back to my junior high and high school days when my dad and I would run and race together. Back to a time when I would call him at work after a run and let him know to the second how fast and how far I had run. I remember the training runs where my dad would effortlessly glide away from me and show me that there was much to learn about how to run. Well now it was going to be my turn. I would turn the screws to him when the time saw fit. You know, give it back to the old man a little bit. It didn’t happen. Even after getting some new shoes and gear, the early motivation waned away last year. I never asked why, but I couldn’t make him get out there on the road. Fast forward to about two months ago, when my dad said he wanted to run the Detroit Free Press Half Marathon this year. He is turning 60 and wanted to do something. Could he do it? Absolutely! If there is one thing I know about my dad is that when it is something he wants, he will get it done. Put a brick wall in front of him…he is going through it. I wrote up another plan working within his busy travel schedule for business and added plenty of rest days and some cross training. It didn’t hit me until his long run of 8 miles this weekend but my dad and I have traded places in some respects. It was not about the time for a distance, the pace, or me giving it back to the old man. Nope, it’s about trading text messages about how his run went in another city, where can he find some hills to run, and when can we run together again. It’s about sharing a banana and giving me a new Power Bar to try after a long run. I realize now, that my time with my dad out on the road for a run is something special and not to be taken for granted as I did years ago. Some father’s and sons might go fishing, hunting, or throw back a couple of cowboy pops to maintain their relationship when life takes them down different paths. Running has been the road that has led my dad and I back down for another chance to move forward for a few more miles. 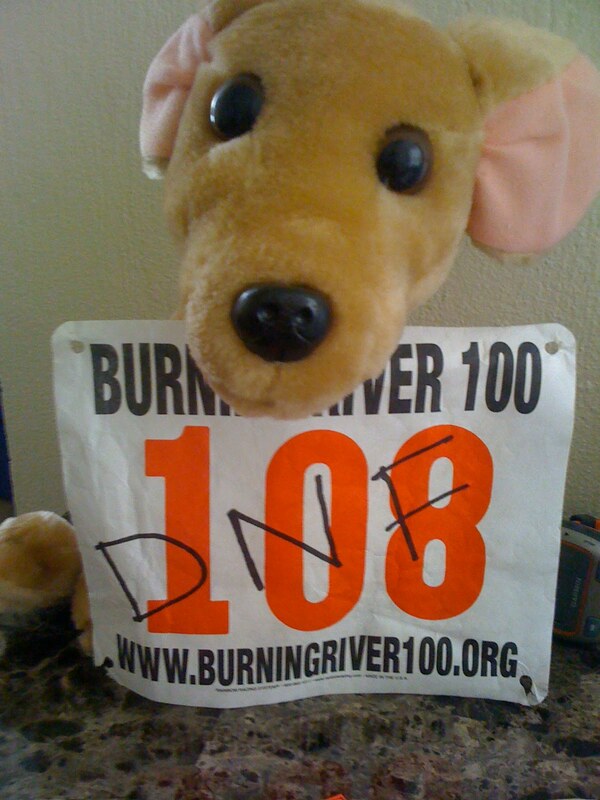 Simply put, I did not finish the 2010 Burning River 100 mile endurance run. My BHAG for the year was not achieved, the goal not met, but in all honesty it was the happiest DNF that I have ever had. My only other DNF was my first 50 miler at Dances with Dirt in Hell, Michigan when I got so lost (adding approximately 5 miles) before the 50k checkpoint that I was unhappy and stopped. I knew going into Burning River that my goal was to simply keep moving forward. That motto, learned after my DNF @ DWD had proved successful along with the attitude that my running has to be fun. Driving down the day before the race by myself, gave my mind plenty of opportunity to run through it's normal checklist of pre-race jitters: Why are you doing this? A hundred miles...how about just 50? Dude, you are gonna feel like road kill come Monday. I knew it was best to just let my mind run with the thoughts for the moment and after a quick nap and the arrival of my crew, I was good to go. My crew, amazingly all listeners of the podcast, had volunteered their own time and money to travel from California and Alabama respectively to help me with this selfish journey. The pre race dinner centered around drop bags, nutrition, and the speech that come hell or high water that I am going to go through some bad patches, but you shove me out of the aid station were all gone over, but no one mentioned about this being fun. Fun? Fun is subjective. For me, ultras are about spending the day away from the speed of everyday life and getting into a flow. You are reduced to the movement of your two feet and the span of the open road or trail. There are no other responsibilities other than to keep moving froward. After a period of time, and it varies on most runs, I normally slip into a rhythm and although the run might be hard, I am having fun. Come race morning, I was feeling ready to go. The weather was going to be ideal (low 80's, next to no humidity, cloudy skies) and my buddy Kevin and I agreed to stick to a run 5 min/walk 5 min pattern for as long as we could maintain. Miles on the open road seemed to float by easily but by about mile 18 I was just there. I wasn't feeling great, I wasn't feeling bad, and I certainly wasn't into any flow. I had to start my running a bit earlier before the next interval because Kevin was running so strong, but no big deal. Then it happened. Somewhere after the 33 mile mark, I had started to slow and told Kevin to go on, and I was alone for the first time in the day and started to evaluate. My ITB (nicknamed Irene) that had caused me to cut mileage for about 3 weeks? Not bad at all. In fact, it had warmed up nicely and was feeling good. Tammy the Hammy which had bothered me after Boston...not even there. Energy? not bad. Stomach? a bit full but just walk and it will feel better. Having fun? That's when it became real. I know ultras have highs and lows, and maybe I was at a low spot, but you know what, I wasn't having fun. Being present in the moment, I told myself that I wasn't having fun that was gonna be it for the day. As fellow runners ran by and asked if I was ok, I told them that I was trying to reset my fun button. Most offered kind words of encouragement, but it has to come from within. I know I had people who had come a long way to help me out, but if I wasn't being honest with myself then surely they would be able to see that. As I rolled into the 39.6 mile aid station, I told my crew that was it. I was done. I couldn't reset the fun button. Dutifully, they went thru all the things we had talked about in terms of not letting me sit to long, etc, but that was it. They went so far as to even call my wife who was in Chicago to try and get me back on the trail, saying I would regret it later, but I told her I would be ok with it. When that didn't work, they made me take my glasses off and look them in the eye and tell them I was done. So after 8 hours and 40 minutes, that was it, my day of selfish forward movement was over. A DNF in the books. However, that was not the end of the day for me at Burning River. The crew dropped me off at the hotel for a hot shower, some food, and a short rest, and turned their attention to helping get my friend Kevin to the finish line. I have said in the past that this community of runners is nothing short of amazing, and that day proved it right there. After a brief respite, I was like brand new, and wanted back in the game to help my friend finish. I met the rest of the crew out at Happy Days and spent the next 45 miles helping out. My fun button had been reset and I was happy. I hooted and hollered as I saw fellow runners come in and met Kevin at each aid station to help out with his needs. Seeing the race as a crew member was just as much fun and just as exhausting in some respects as running the race. The opportunity even presented itself for me to run the last 8 miles with Kevin to the finish which was pretty special. Am I disappointed that I didn't reach my BHAG? Absolutely not.Ultras for me have always taught me a lesson about myself that I have been able to carry over to the real world. 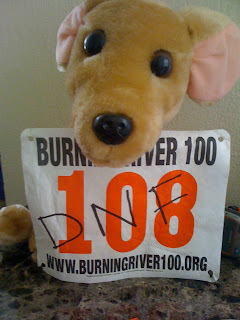 With last year's finish of the Burning River 100, it was that I can do so much more than I think I can. Don't ask me why I had to cover 100 miles to figure it out, but there it was. This year's Burning River taught me that if I am brutally honest with myself then I can be happy with the decision and have no regrets. Again, something that I was only able to answer out there on the trails. I was unhappy running, but happy helping a good friend finish his first 100 miler. I got a chance to meet some amazing people from across the country and hang out with them. A happy DNF.